It is said that long ago lived two Incan kings, Illimani and Illampu. Both were wealthy and each owned vast quantities of land in the Kollasuyo (now the Altiplano in the Bolivian Andes Mountains). Each also had one son. Jealous of each other’s wealth, one of the kings mounted an attack against the other and during combat, each was mortally wounded. Although both of their sons had been against the war to begin with, upon their death beds each made their son promise to avenge their death by warring against each other. Bound by their promises to their fathers, a second battle ensued and this time, as history always repeats itself, the sons each mortally wounded the other. However, unlike their fathers, before dying the princes forgave one another and made their servants promise to bury them side by side on the battlefield. Pachamama (known as Mother Earth or Mother Nature, and sometimes referred to as the Goddess of Fertility) appeared to the princes before they died. She told them they should not be punished for their fathers’ wrongdoing. So she caused the stars of their fathers to fall from the sky. Upon crashing to the earth they formed the snow-covered mountains you can still see on the Altiplano today, which have been named Illimani and Illampu, and are the two highest mountains in the region. It is said the rivers that form when their snowcaps melt are actually their tears of regret and these fertilize the valleys where the Kantuta now grows. The Kantuta is considered a symbol of unity because its two primary colors (red and yellow) were the colors used by the king’s sons. Green is the color of hope. 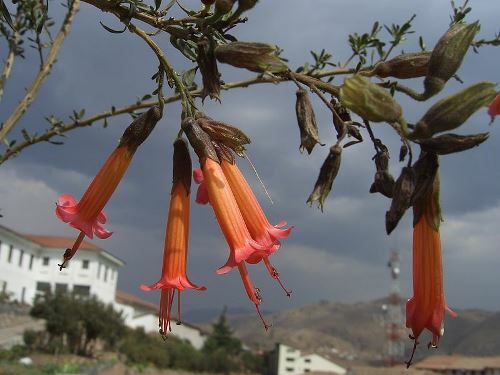 By the way, did you know that Bolivia actually has two national flowers?